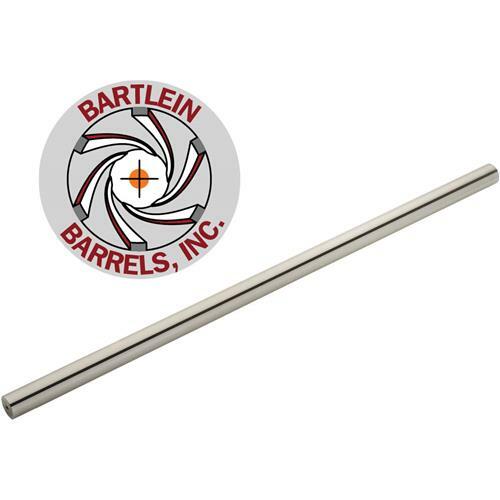 We are pleased to offer top quality Bartlein match rifle barrels in the most popular sizes. Bartlein stainless steel barrels are the choice of champions worldwide and are used by numerous members of the US Team. Many national records have been set using these barrels. In fact, the President of Grizzly has set several national records in F-Class shooting. Bartlein's precise machining and 5R grooving process increases accuracy and reduces copper build-up. Their custom built CNC machines are the most modern in the industry and there is generally a long wait to get a barrel from them. We place huge orders many months ahead of time and stock these barrels so you can get working on your favorite project immediately. All barrels need a final polish and come with 1" extra overall length for cutting and crowning. Length: 30" Finished, Blank is 31"
Approx. Raw Barrel Weight: 10.31 lbs. Please note: We do not accept returns on this item. However, it is covered by the manufacturer's warranty and in certain circumstances may be returned to the manufacturer. Barrels need to be threaded and chambered to fit the desired action. For returns or manufacturing defects, please contact Bartlein directly at (262) 677-1717. Please contact service@bullets.com with questions prior to placing your order. Received barrell within a week. Very satisfied eith product and prompt service.